I’ve always wished I was a better dancer. It’s not that I’m uncoordinated–I figure skated for eight years, until I was 16 (though I fell a lot, once cutting myself badly enough with my skate blade to have dozens of stiches), I have a brown belt in Shotokan karate … which I haven’t practiced in ten years or so, and I haven’t broken anything. Yet. Oh, except for my ribs, but they may have only been cracked. I had this Chevy Blazer, you see. It was back when carburetors were a thing, and I flooded the engine on a regular basis. I got good at taking the lid off the filter and sticking a screwdriver in the top of the carburetor to hold the choke open while I started the engine. One day, I was coming out of my doctor’s office and I flooded the engine. So I climbed out with my trusty screwdriver, opened the hood, and stood, as I usually did, on the front bumper of the truck (it was very high) to do my thing. Got it started okay, but when I went to retrieve the screwdriver, my feet slipped off the bumper and down I went on the hood latch. I basically impaled myself. I managed to get down and rolled around on the ground, screaming, until a nice man helped me up and back into the doctor’s office. I learned a lesson that day. Which was, obviously, be careful not to stand over the hood latch. So anyway, I can’t dance. At least not well. Which has absolutely nothing to do with breaking my ribs, but there you go. 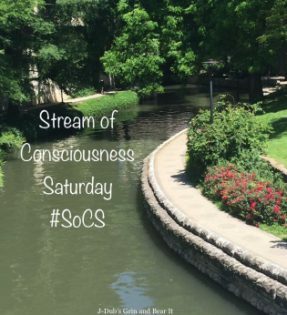 That’s what Stream of Consciousness Saturday is all about … tangents. Hey, I could have called it Tangent Tuesday instead! Feel free to use that. 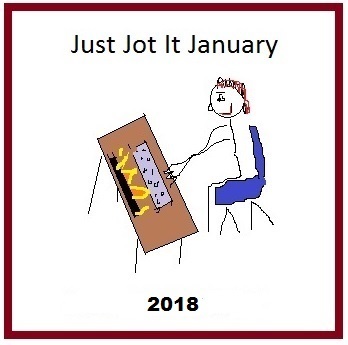 Categories: Blogging, Blogs, Funny, Just Jot it January 2018, Life, Random, Stream of Consciousness Saturday | Tags: carburetors, dancing, Humor, inspiration, JusJoJan, SoCS, writing prompt | Permalink.